If these photos look old, they probably are! I mean... out of date! Try reloading the page. The date shown above will change if the page is newer. Get notified of what's happening! Dinner at Los Lunas - Saturday August 18th. These images have been reduced in size to load faster, and a larger image will open in a new window if you click on the photo. Please note that loading can take extra time with some connections. 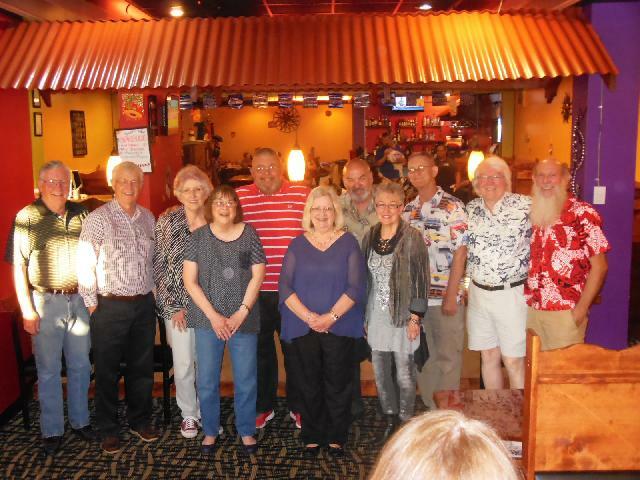 This festive bunch of '66ers only needed sombreros to round out their evening at Los Luna's May 20th! Photo credit: Mary Anne Phillips, '71 Raytown South High School, a.k.a. Jim's wife! Photos sent to us by members. Photos from the 50th and more! Senior class pages from the 1966 yearbook. Support the JHS Foundation through our class! Buy pillcases, CDs, mugs, and more! Join the List Server for alumni information and more! We have set up a members only listserver for our JHS alumni use. This message board works like a bulletin board, where posts are made available to all members. Postings can include anything pertinent to our class, including member contact and email exchanges, classmate searches, and events. Only members may post, and all email addresses are hidden. The committee will post event information and website updates here. You are encouraged to join this group instead of Classmates-dot-com. Our service is free (no strings), and if it doesn't work for you, you really can unsubscribe! Click this link to browse the JHS 1966 MESSAGE BOARD as a guest. You can join the group using the link below. Note: Submissions to join require confirmation using a valid email address. Live outside of Joplin? Use this link to get The Joplin Globe - Online Edition. Local feature stories and area happenings can be found at the Joplin Independent. Get information about our area from the Joplin Convention Visitors Bureau. Our Joplin Area Chamber of Commerce is very active promoting local businesses. Planning a trip to Joplin? Here are the lowest local GAS Prices from around the area. into The Joplin Museum Complex and houses several different collections. There is always something interesting going on at The Spiva Center for the Arts in downtown Joplin. with downloadable Death Certificates from 1910 to 50 years ago. The index has PDF scans of certificates and updated monthly. Use the advanced search for more flexibility. The Virtual Wall Veterans Memorial lists casualties of the Vietnam Conflict www.virtualwall.org and is searchable by state. 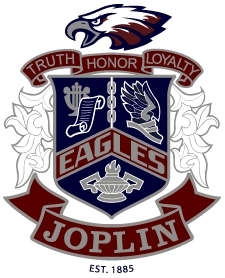 JHS - Joplin High School home page. School and foundation information, merchandise, event listings, and more. MSSC is now MSSU - Missouri Southern State University. Located at Newman and Duquesne roads. MSU - Missouri State University in Springfield. Second largest school in Missouri. Home of the Bears. MU - University of Missouri, Columbia, MO. Home of the Tigers. For fun, this little movie "Looking For My Wallet" (2.5MB) sums up what we all are experiencing these days! their renditions of The Ode to the Green Parrot at the 40th class reunion. For your enjoyment, the PDF files of Vicki's version and Jim's version can be downloaded. A group of Mr. Sovereign's former students have started an endowment for a scholarship to MSSU. Click here to go to the Oliver & Roberta Sovereign Facebook page. Some of the favorite strips we grew up can be found at GoComics.com, and they can email them to you daily! Weatherbug has reporting stations and CAMS around the nation. This one is at the Joplin Regional Airport. NOAA Storm Prediction Center to see Joplin and vicinity convective outlooks and forecasts. RAP Get real time WX Data from GOES-10 and GOES-12 satellites with visible and Infrared images. Find WX for any city, state or ZipCode with Weather Underground. Use this link for Joplin and vicinity. Viruses, SPAM, and Hoaxes! Ever received an email that just begged to be passed on to all your friends! Some with tear jerking stories, others with offers that seemed too good to be true? Some can be sinister. Search SNOPES.COM - Urban Legends Reference Pages to determine authenticity. This site is just plain interesting - it's amazing what people can think up! The darker side of the web? A little information about cookies, hackers, and viruses. the Quotes and Proverb archive. right time! At Heavens-Above, get accurate predictions for flares, satellite passes, comets, and more. You will need to provide your Latitude and Longitude information to configure this website for your viewing. We have set the location initially for central Joplin, Missouri. offers a free subscription service, or you can just browse from here. subscription service in addition to a site full of interesting photos and hot topics. It is updated daily. A shameless plug for the Joplin Amateur Radio Club. The American Radio Relay League is a national organization for the benefit of amateur radio operators. Of course we can't forget September 19th. "Avast you lubbers!" "Arrr... " Talk like a Pirate Day. Please send any favorite links, page updates, corrections, comments, and reports of dead links to Jim Scott. Enjoy! The content and management of this website is solely the responsibility of James D. Scott. Any violation of copyright is accidental, and if discovered, will be promptly corrected. All material presented on this website is intended for the express enjoyment by alumni of Joplin High School and Memorial High School, and is without pecuniary interest. However, all content is assigned to, or is the property of the publisher (aka head guru), and is hereby copyrighted 2006 - 2017.
who expense every dime they can! "Y'all come back now! Ya hear?"